A device that would accept verbal messages and store them for replay from any remote station. H.G. Wells was not the first person to think of a telephone answering machine; however, he was the first one to really get it right. On his second walk with Mr. Barnstaple he said he was going to hear from his mother, and Mr. Barnstaple was shown the equivalent of correspondence in Utopia. Crystal carried a little bundle of wires and light rods; and presently coming to a place where a pillar stood in the midst of a lawn he spread this affair out like a long cat's cradle and tapped a little stud in the pillar with a key that he carried on a light gold chain about his neck. Then he took up a receiver attached to his apparatus, and spoke aloud and listened and presently heard a voice. It was a very pleasant woman's voice; it talked to Crystal for a time without interruption, and then Crystal talked back, and afterwards there were other voices, some of which Crystal answered and some which he heard without replying. Then he gathered up his apparatus again. This Mr. Barnstaple learnt was the Utopian equivalent of letter and telephone. For in Utopia, except by previous arrangement, people do not talk together on the telephone. A message is sent to the station of the district in which the recipient is known to be, and there it waits until he chooses to tap his accumulated messages. And any that one wishes to repeat can be repeated. Then he talks back to the senders and dispatches any other messages he wishes. The transmission is wireless. The little pillars supply electric power for transmission or for any other purpose the Utopians require. For example, the gardeners resort to them to run their mowers and diggers and rakes and rollers. From Men Like Gods, by H.G. Wells. Shortly after inventing the phonograph in 1878, Thomas Edison thought that a possible use would be as a recorder of telephone conversations. However, the first telephone answering machine was probably created by Danish inventor Valdemar Poulsen; he modified his Telegraphone (first patented in 1898) to answer the phone automatically and record a message. 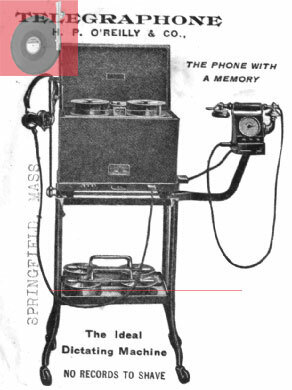 The Telegraphone was eventually advertised as "the phone with a memory." Thomas Edison created the Telescribe in 1914 and marketed the device the following year; the Telescribe could be used to record phone conversations. It was not an automated phone answering machine. Thanks to the magic of sensible copyright laws, you can read the text of this novel on the Internet for free - see Men Like Gods. Thanks also to S. Jones for pointing out this item and supplying a quote.